I know what you’re thinking. Pumpkin? You? In May? I know, right? 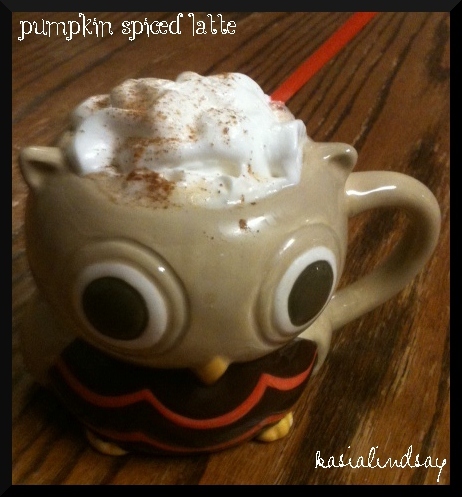 I totally broke my pumpkin belongs in the Fall and Winter months rule to make this recipe. And guess what? I loved it. It gave me the same warm and cozy feeling I get when I watch Gilmore Girls and see the red and orange leaved trees. Just like my Gilmore Girls, I’ll still save pumpkin for special moments out of season and bask in it like crazy in season, but I might occasionally break my rule now. I did break it for a good reason. We had one of our potluck breakfast meals at work. 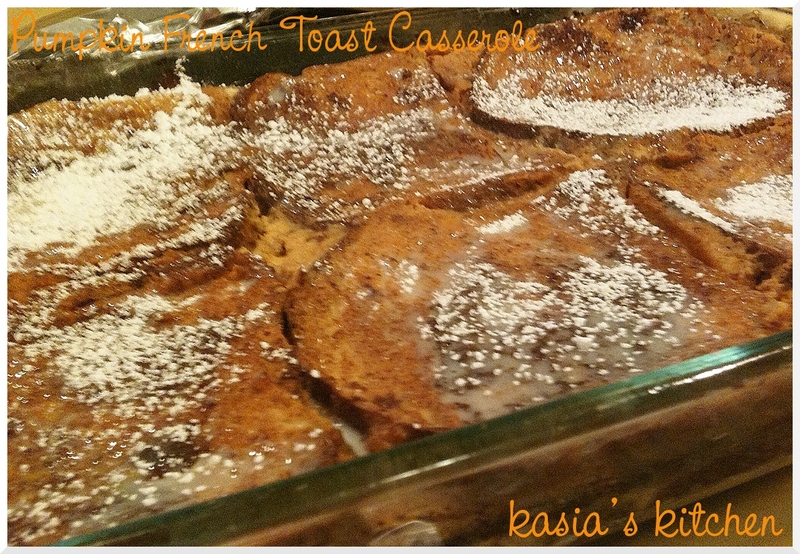 A coworker who started post fall, had heard about my Pumpkin French Toast Casserole and then I didn’t have a choice! I like it when people request my food! I just can’t say no. 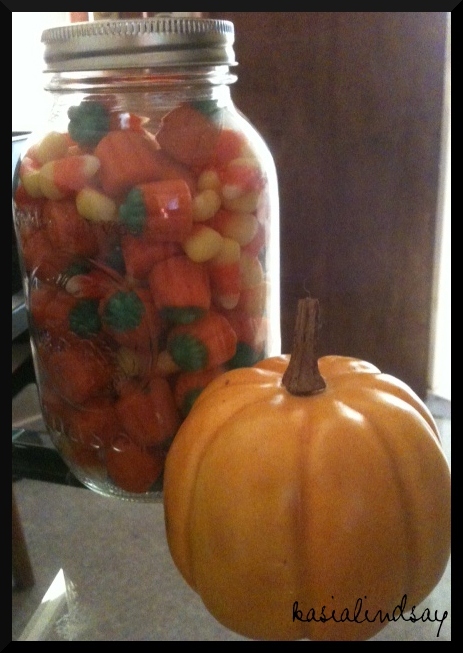 The other factor that pushed me over the edge to saying yes to making a pumpkin dish? 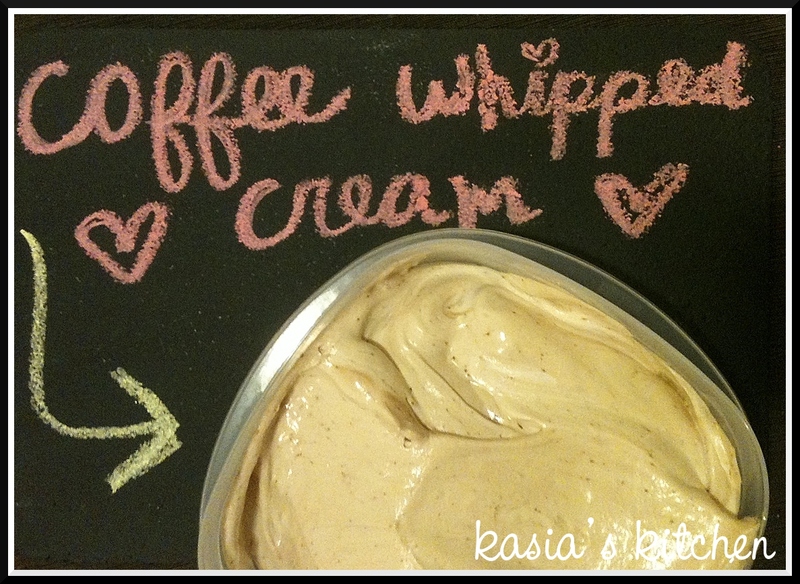 Coffee whipped cream. Let’s just start things off right and talk about this! Combine. Stir. Seriously, that’s it. It’s the simplest thing every but oh man is it good. I mean how can you say not to anything topped with Coffee Whipped Cream? My coworkers love to put it in their coffee too. It compliments anything pumpkin flavored magically and also just spoon. It’s the perfect topping for a good old spoon. Did I mention it’s also guilt-free? 0 points for 2 tbsp or 1 point for 1/4 cup. Melt Brummel and Brown butter and pour into a 9 x 13 pan. Mix the brown sugar, cinnamon and pumpkin pie spice in a small bowl. In a separate bowl whisk eggs, milk, and vanilla together. I like to shake in a little extra cinnamon and pumpkin pie spice into the liquid mixture. Time to layer. Layer 6 pieces of bread in the pan. 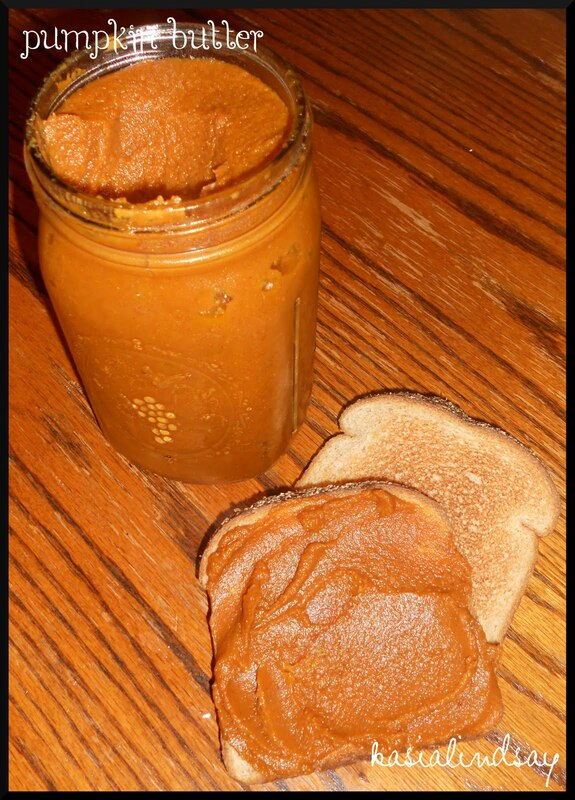 Spread a thin layer of pumpkin across the bread. Sprinkle half of the brown sugar mixture over the bread. Layer the other 6 pieces of bread on top and spread with pumpkin. Pour the liquid mixture over the bread. Sprinkle the remaining brown sugar mixture over everything. Cover and refrigerate overnight. The next morning, cover the dish with tinfoil and bake at 350 for 30 minutes. Remove from the oven, uncover and bake an additional 15 minutes. It should be golden brown and set. Sprinkle with powdered sugar to make it pretty. Serve with syrup, butter, whipped cream OR COFFEE WHIPPED CREAM. 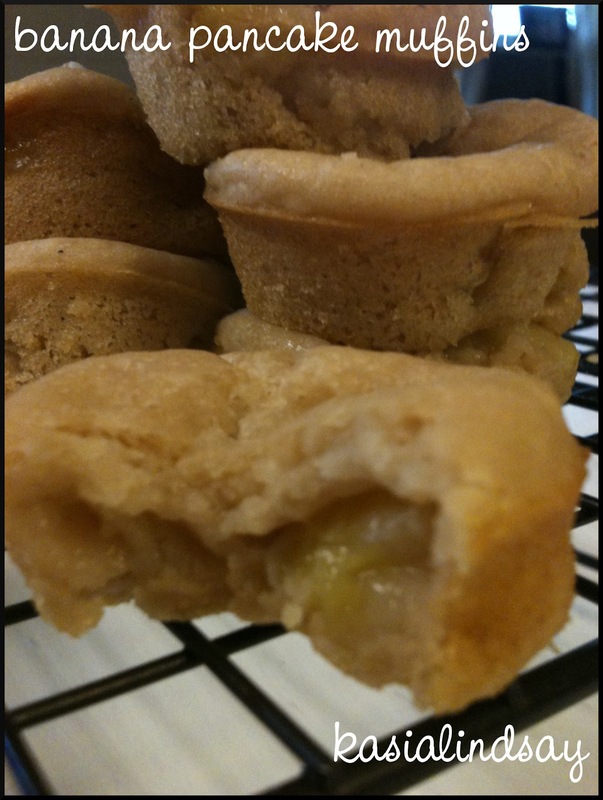 Yields 12 medium sized servings at 4 points each or 6 large servings at 8 points each. 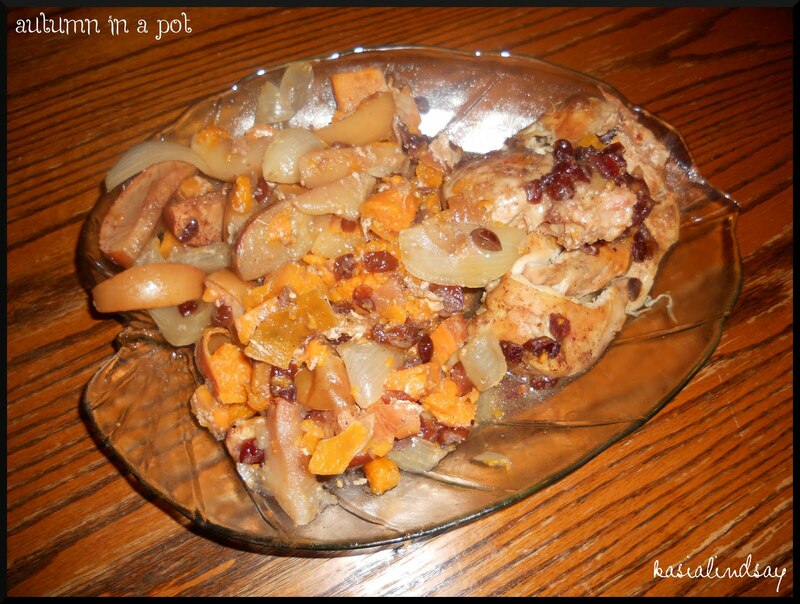 If the summer heat is getting to you and you’re missing fall as much as me, I highly recommend this dish now! More green! I do love green stuff a whole lot. It worked out well for me when I started Weight Watchers, the loving veggies and fruits thing. I quickly discovered how to make a big salad filled with 0 point things and selectively pick my point worthy toppings of choice. I’m always looking for ways to spice up a salad, make it main dish worthy, or tweak the flavors to make it a perfect side for any meal. One of my favorite ways to do that is to make my own salad dressing. I can eat a salad without dressing if it has the right toppings, but mostly, I have to have some dressing on my salad. 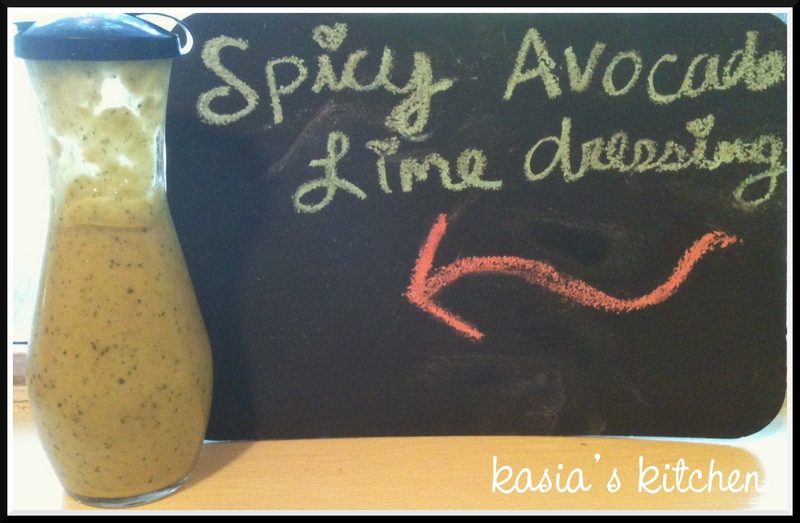 Store bought creamy dressings are always high in points and so they are my favorites to make at home. 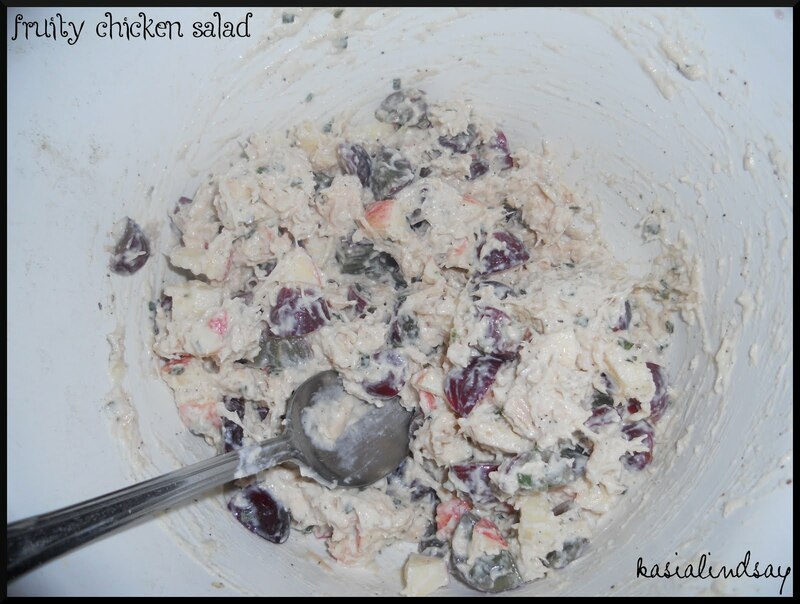 Skinny Taste is the best source for healthy made at home creamy salad dressings. Add cultured buttermilk powder and water in a food processor first to combine. If you’re using normal buttermilk, just toss it all together. Add in all the other ingredients. Most of them don’t need to be pre-chopped. Deseed the avocado and remove the meat from the shell and just toss it in whole. Slice the jalapeno in half lengthwise and then again and toss in. Roughly chop the green onions. 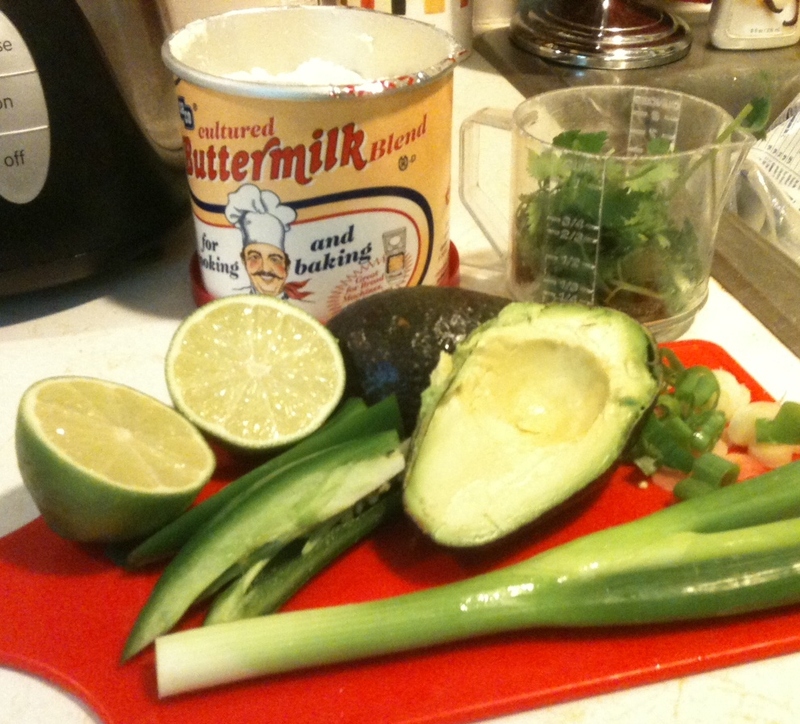 Add cilantro, sugar, garlic, lime juice, salt, cumin and pepper. Pulse until blended well. Note – If you don’t add the jalapeno seeds, decrease the amount of sugar, it would probably be a little too sweet. Warning – this is SPICY! Like serious kick here folks. I liked it, but it’s even spicier than the salsa I made earlier in the week. Last step. 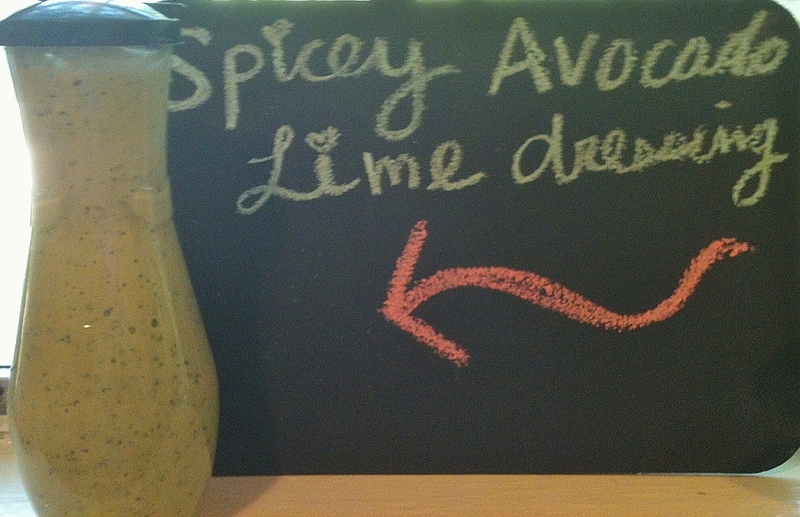 Don’t misspell spicy when you go to take a picture of your yummy dressing for you blog. Oops. Yields 1 1/2 cups and 12 servings. 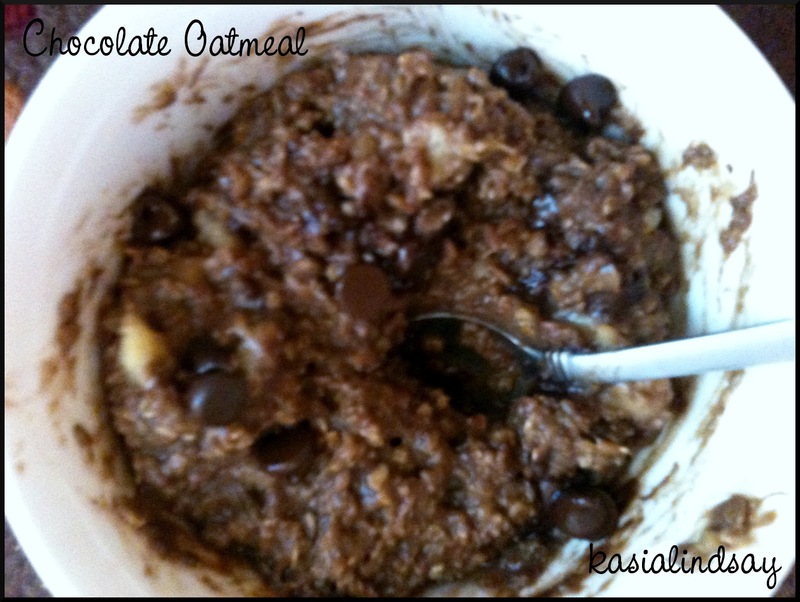 Each 2 tablespoons serving is only 1 point! 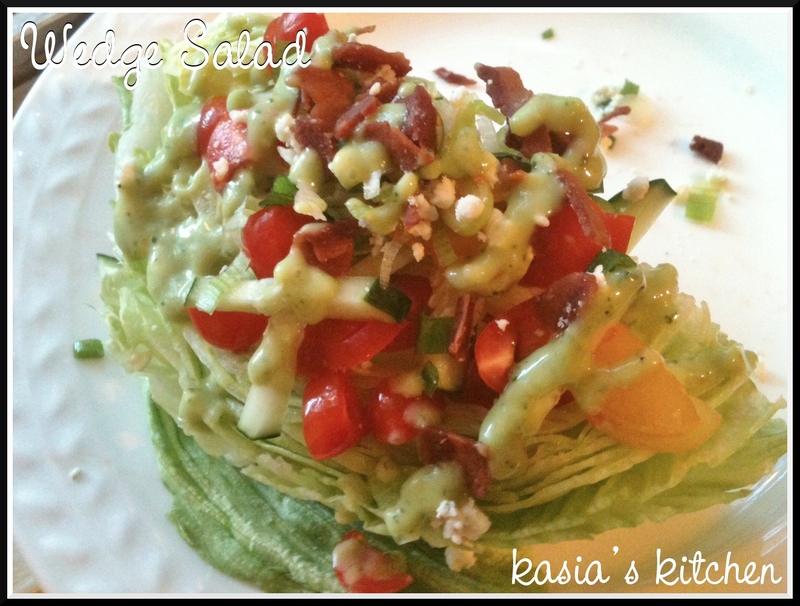 Add to your favorite salad or make one of these lovely wedge salads I made! Assemble. Really! It’s that easy. Use a big mega knife (I used a watermelon knife) to slice a head of iceberg lettuce in half and then in half again. Cut off the hard end of edge wedge. These made BIG salads. If you want smaller ones you could cut each iceberg half into thirds instead of in half again. Carefully sprinkle on your toppings. Drizzle with your favorite dressing and splash with a little balsamic. 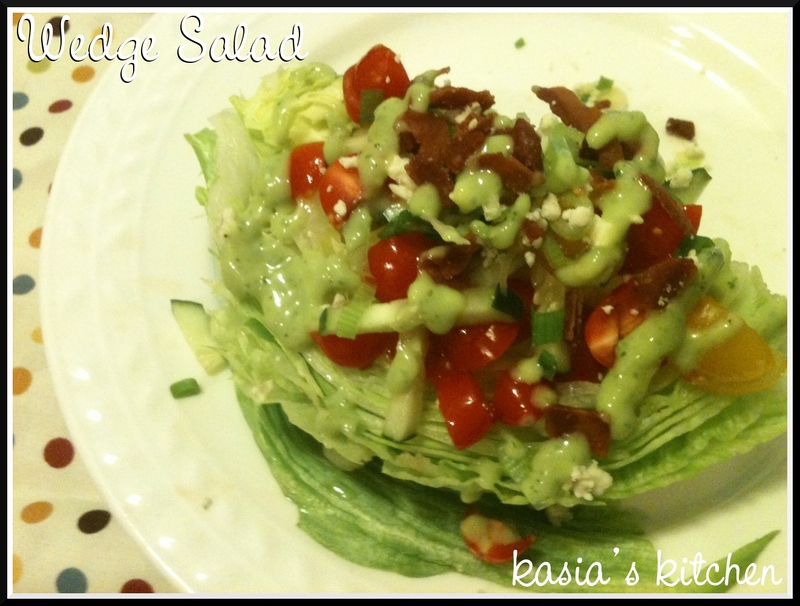 The Weight Watchers points value of your wedge salad will depend on what you add to it. 2 tablespoons of reduced blue cheese crumbles are only 1 point. 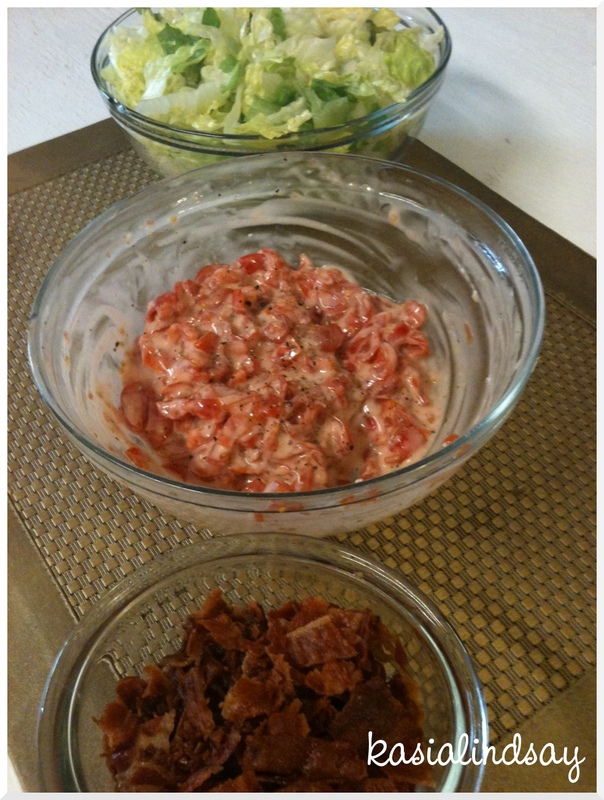 1 tablespoon of turkey bacon bits is 1 point. 2 tablespoons of the dressing is 1 point. The rest is 0! My whole big salad was 3 points, and less probably! I didn’t use a whole 2 tablespoons of dressing or blue cheese, but always better to round up a little. You know I don’t love summer. I’m admittedly a little bit of a diva and I hate sweating. If I could have it my way, I’d live in a place where people had the same hospitality and helpful spirit as my great Mississippi, cooked just as well, but the temperatures would be quite different. All year round it would never be too hot to wear cardigans. In Cardiganland I’d never sweat or be hit in the face with pea soup thick humidity that makes my hair look like a mess. Dislike for Mississippi heat and summers aside, there are parts of summer I like. I like afternoon storms, even the ones with lightening and hail like we had yesterday. I like snow balls. I like popsicles. I like Smith County watermelons. I like paper sacks full of home grown veggies from my pawpaws garden. I like cookouts and BBQs. I like sandals. I like swimming pools. And despite my love obsession with fall and all its flavors, I actually love the flavors that go along with the rising temperatures of summer. 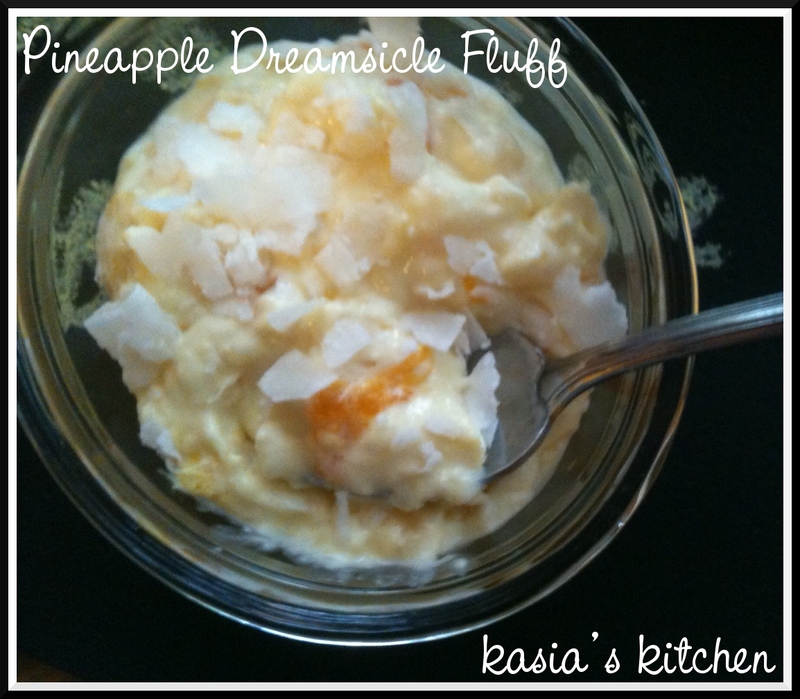 This little easy to make treat is guilt free, full of summer flavors and reminds me of my favorite snow ball, dreamsicle! Stir together pudding mix, cool whip, drained oranges, and pineapple with its juice until combined. Chill and eat! Yields 5 cups and 10 – 1/2 cup servings. Each 1/2 cup serving is 1 point on Weight Watchers! Totally guilt free. I sprinkled a little shaved coconut on top of mine. 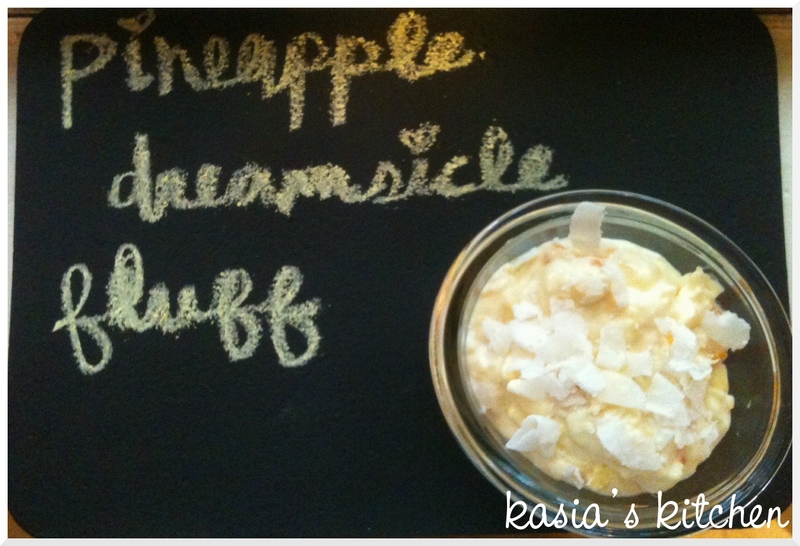 1 tablespoon of sweetened coconut is 1 point, but I didn’t use a whole tablespoon. I’m certain I will keep my refrigerator stocked with this all summer. What’s your favorite summer treat? I have to quickly share these, just because they were probably my favorite recipe from last week! I love cabbage. Love love it in most forms. However, this is probably my new favorite and best way to love cabbage. I found the original recipe and idea on Pinterest. I adapted it to make it a zero point side and to fit with the theme of my meal. It was an Asian(ish) night, so I added sesame and soy to the recipe. I liked it so much I think I’d probably keep the sesame and soy even if it wasn’t an Asian night. Inspired by Martha Stewart’s roasted cabbage wedges recipe. Bad after daylight picture, but I had to share this recipe! Preheat oven to 400. Rinse cabbage and slice cabbage into 1 inch thick rounds. I cut of the end and sliced it in half and then sliced each half into rounds. Line a baking sheet with foil and lightly spray with cooking spray. Season each wedge LIGHTLY on both sides with Tony’s (or salt & pepper). Lightly spray cooking spray over the wedges (just the top, the bottoms will get the cooking spray from the pan). Sprinkle with sesame seeds and roast for 40-45 minutes, or until cabbage is tender and edges are browning. When mine came out of the oven, I splashed them with just a tad of soy sauce. I didn’t plug them into the recipe builder, but sometimes when you cook with veggies or fruits it makes them be points. But all the ingredients I used were zero points and under the appropriate serving to be zero points, so I’m calling them zero points for me! I served mine with perfect (finally!) brown rice and teriyaki meatballs (I used this meatball recipe, but used teriyaki sauce instead of bbq sauce). I’m not a huge fan of ice cream unless it’s my Papaw’s homemade ice cream. I have, however, always had a soft spot for popsicles. My favorite by far has always been the fudgesicle. It’s such a creamy, sweet Spring/Summer treat. 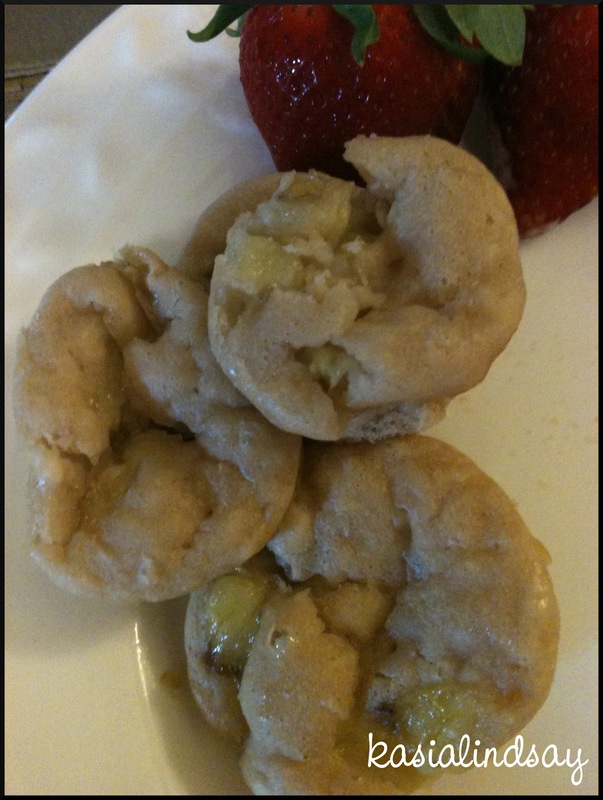 When I saw this super easy and mostly healthy recipe for homemade ones, I knew I had to try it. Thanks Chocolate Covered Katie! I froze my bananas with the peel on. It was a tiny bit hard to peel them, but not impossible if you cut them in half down the middle and then sliced them long ways in half. The peel came off pretty easy that way. Place all ingredients in a food processor and pulse, pulse pulse, blend, blend, blend for a long time until all ingredients are combined and smooth. 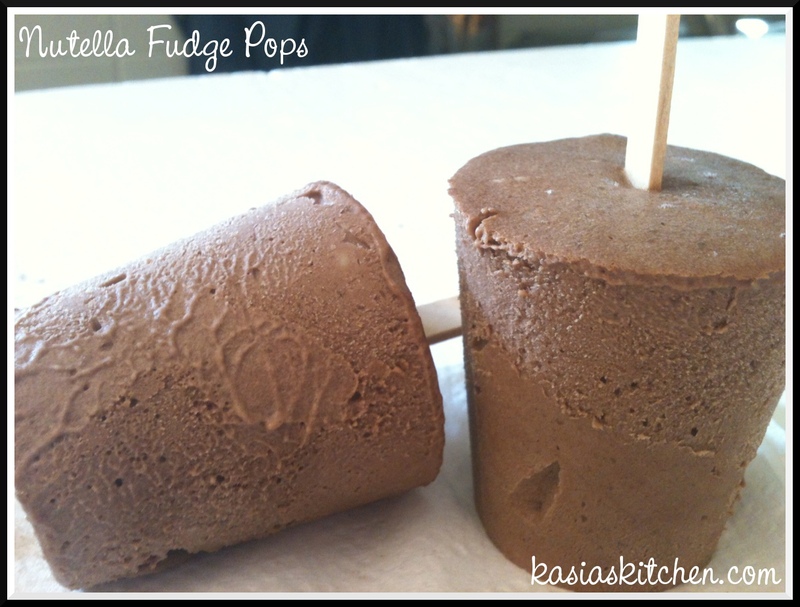 You can eat it straight out of the food processor as a yummy, creamy ice cream, or you can freeze them for fudgesicles! I used paper mouth wash cups to refreeze mine in. 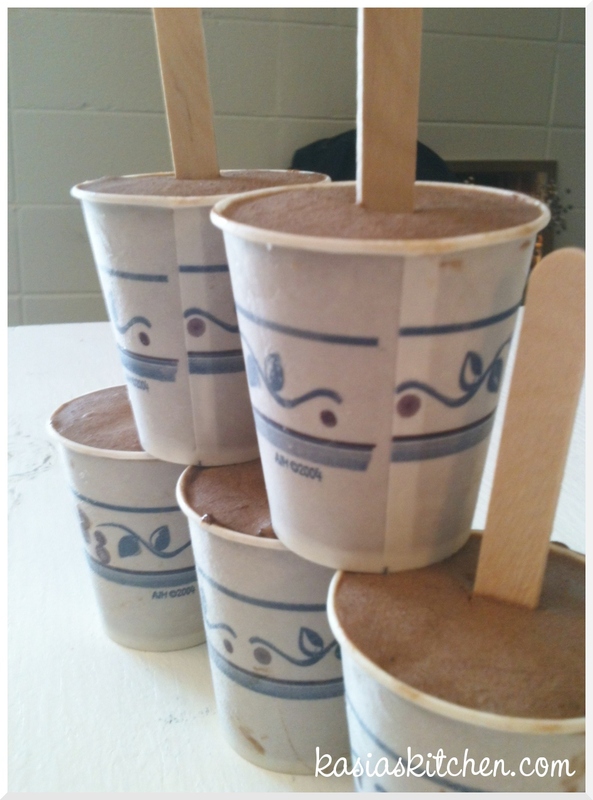 They were quite large servings to me, but I don’t know of any smaller cups to freeze in. Yields 5 servings. 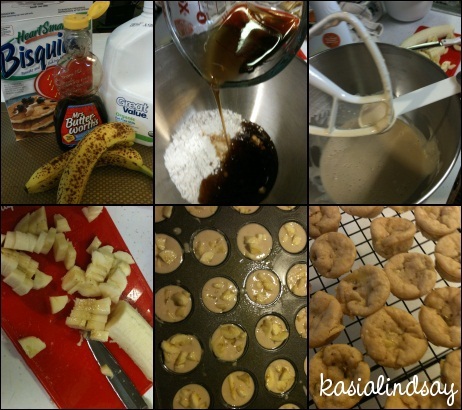 If you count the bananas in the Weight Watchers Recipe Builder they are 6 points each, if you don’t, they are 4. As a meal planning maniac, I’m always on the look out or new ways to do veggies. Veggies are good for you and many are free points on Weight Watchers. I also hate being repetitive in my cooking or getting bored with the idea of anything I want/plan to cook. Therefore, I mix it up often. As I meal plan, I always start with the main dish and build around it. 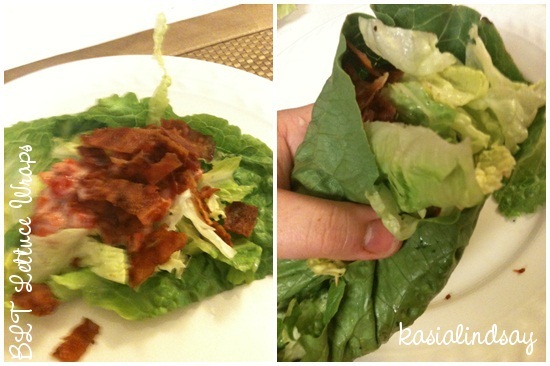 When I picked BLT Lettuce Wraps as a main dish for the weekly menu, I thought it would be a good time to incorporate something still healthy, but a little less healthy than my normal zero or as close to zero point veggie side attempts. This past September a friend and I had just discovered Pinterest. We were obsessed and looking at recipes and DIY projects like crazy. She found a baked zucchini sticks recipe with a rich onion dipping sauce. 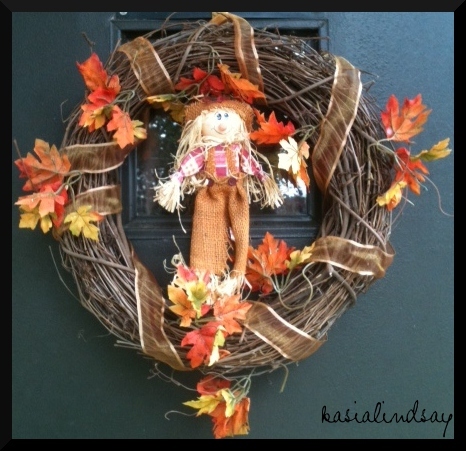 I found a cute wreath idea. And thus began our afternoon. 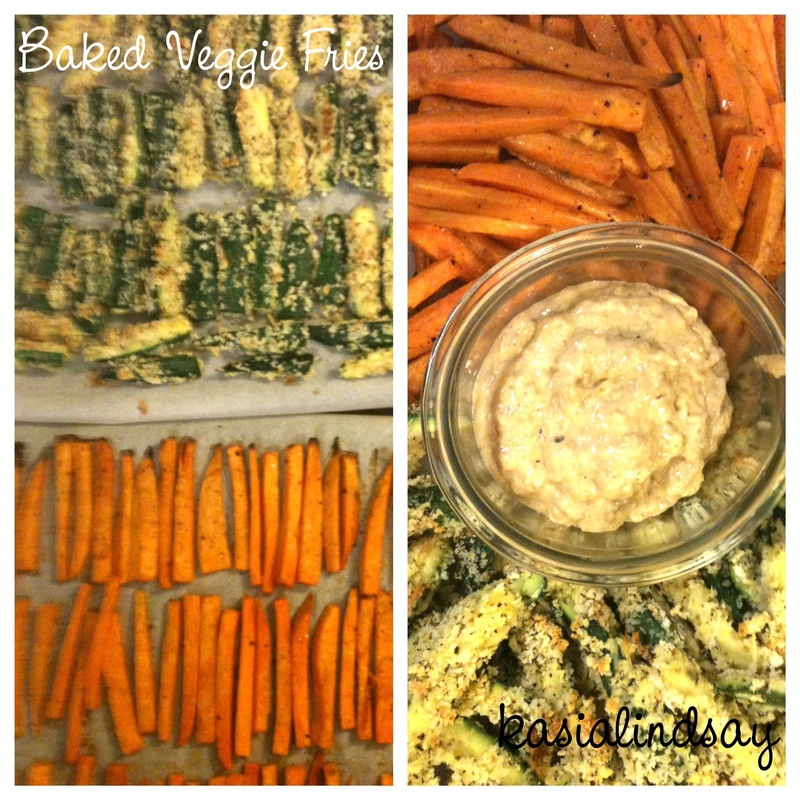 The sticks and dip were divine! I knew someday I’d make them again. 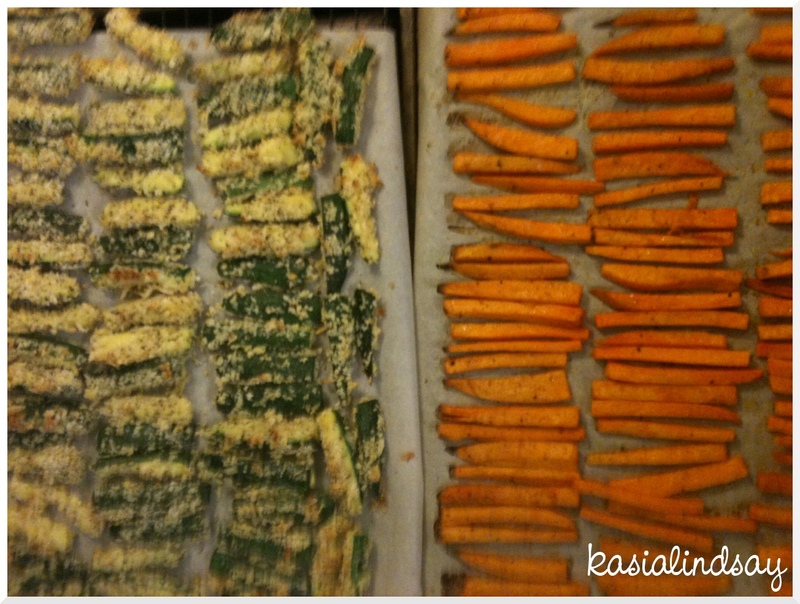 The baked zucchini sticks were perfect as is, low fat and tasty. The dip however, needed some Weight Watcher friendly adjustments calling for 1 cup of full fat mayo in the original recipe (which is exactly how we made it the first time). I like things in threes. It’s more pleasing to the eye and it just makes sense. A meal doesn’t feel rounded to me unless it has three. 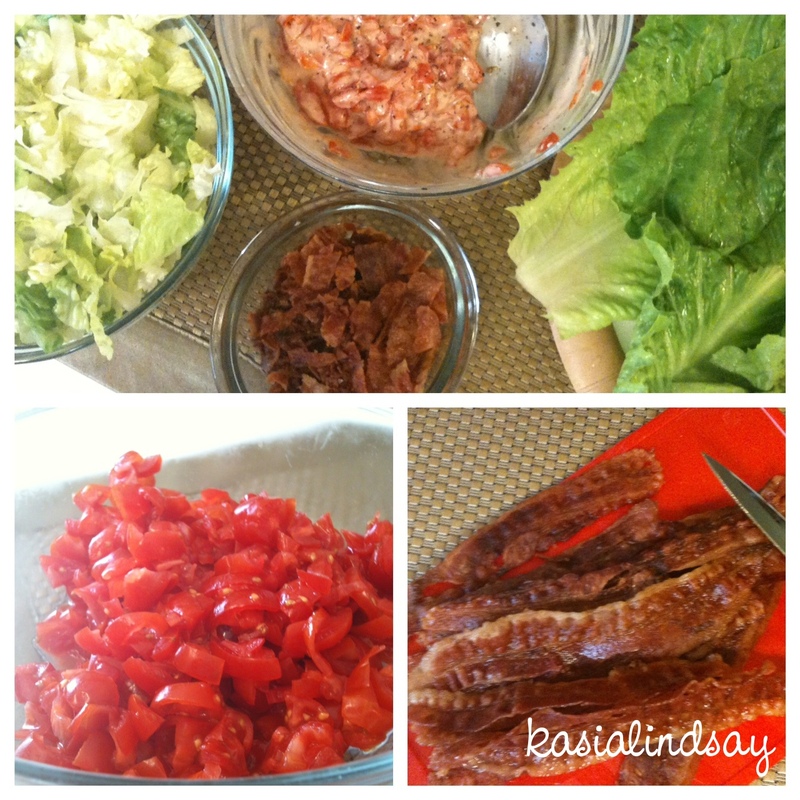 What pairs well with BLT Lettuce Wraps and Baked Zucchini Sticks? Sweet potato fries of course. It officially became a meal I was super excited to make. Heat oil over medium-low heat. Add onions and cook, stirring occasionally. Even though it’s tempting, don’t turn the temperature up to cook them faster. Medium-low, 4 or 5 on my stove, is perfect. Let them get caramelized and browned. You want to see brown. 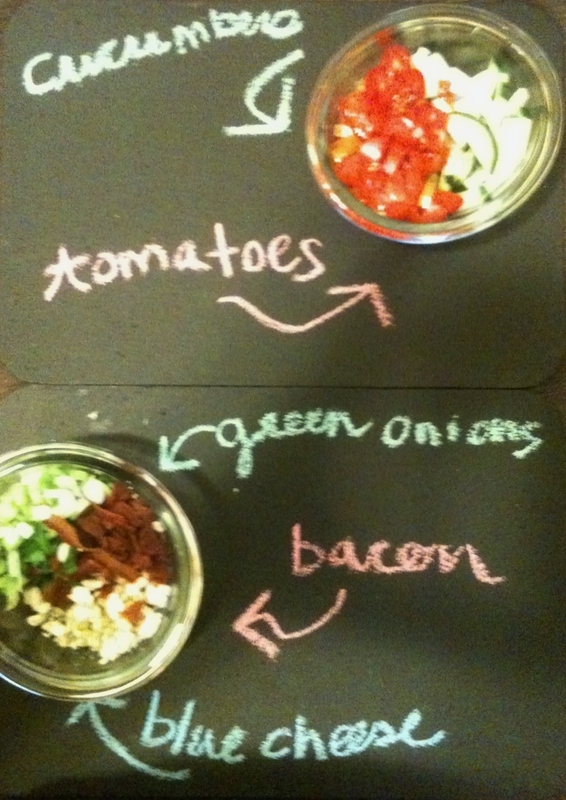 It’s essential for the flavor and color of the dip. They should cook for 25 minutes. When there is 5 minutes remaining, you can sprinkle some powdered sugar over the onions. I feel like this helps them brown a little more and adds to their sweet caramelized flavor. Add vinegar, honey, and mustard into a small food processor. I used my big one because I enjoy using it. 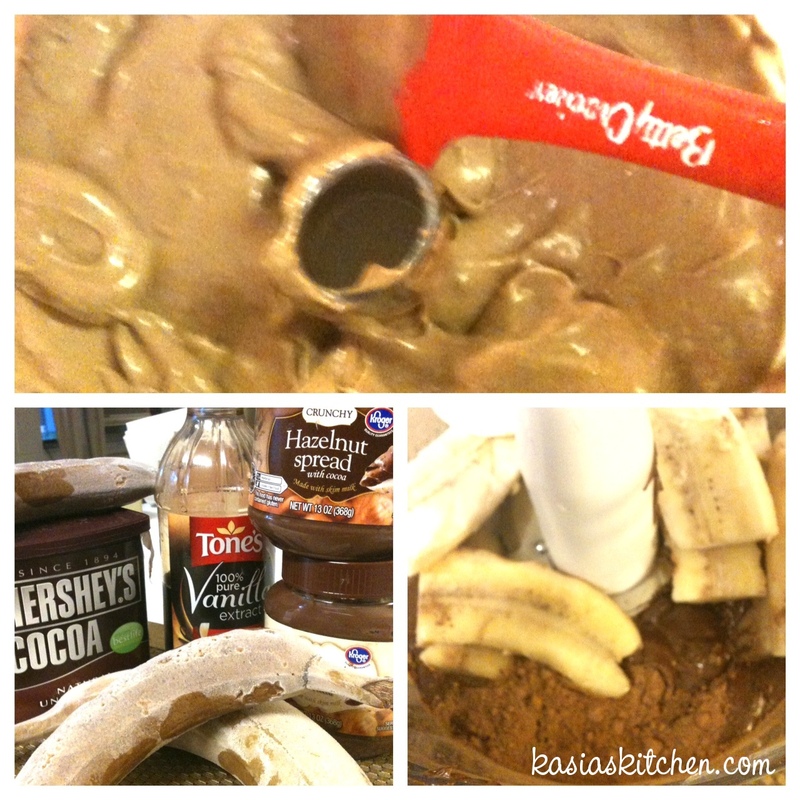 A blender would also work if you don’t have a food processor. When the onions finish add them to the processor. Pulse until it sort of resembles the consistency of apple sauce. 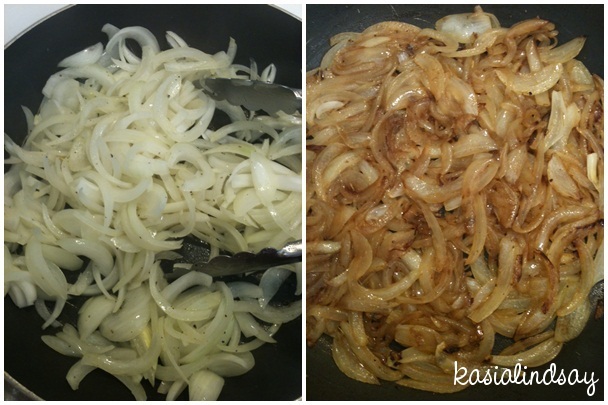 Fold in mayo until onion mixture and mayo are combined, smooth, and creamy. Stir in salt. 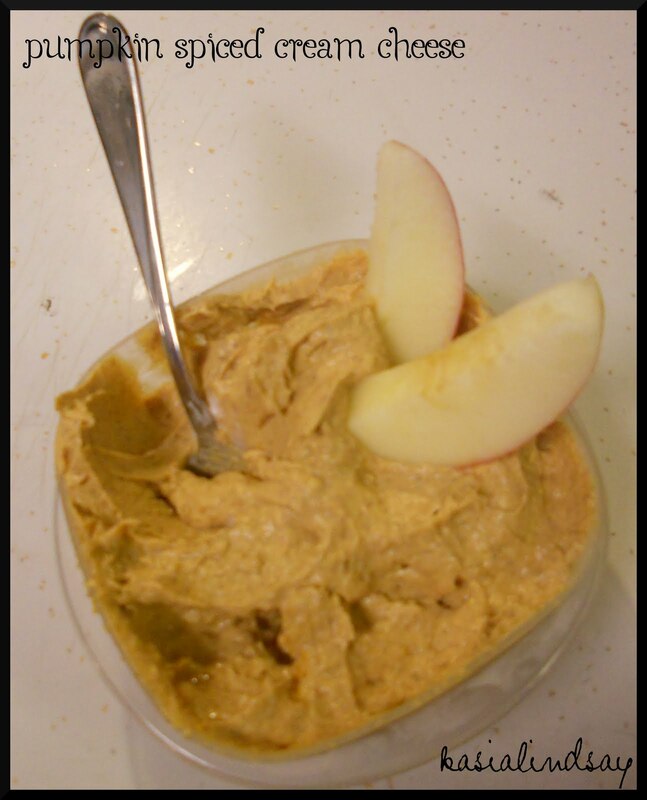 Now to go with our amazing savory sweet oniony dip, we need things to dip. Original recipe at kingarthorflour.com. I pretty much followed her instructions and recipe exactly, but I used egg beaters instead of eggs, Italian seasoning instead of pizza seasoning, and part reduced fat parmesan and part regular shredded. Wash zucchini and cut into 3 inch sticks. She posts a perfect picture on how to cut them (I forgot to take one during that step). 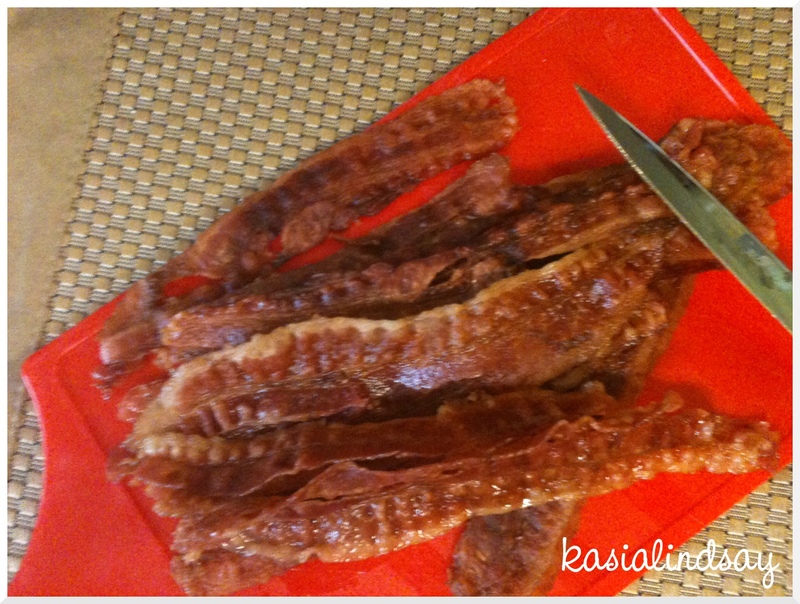 The way it worked best for me was to cut it in half, not lengthwise, but down the middle. Think hamburger cut not hot dog cut. Cut off the ends. Stand each half on a flat end. Cut in nines. Like a tic tac to board sort of. Two cuts north to south and two cuts across west to east. You’ll end up with 9 pieces from each half, 18 per each zucchini. 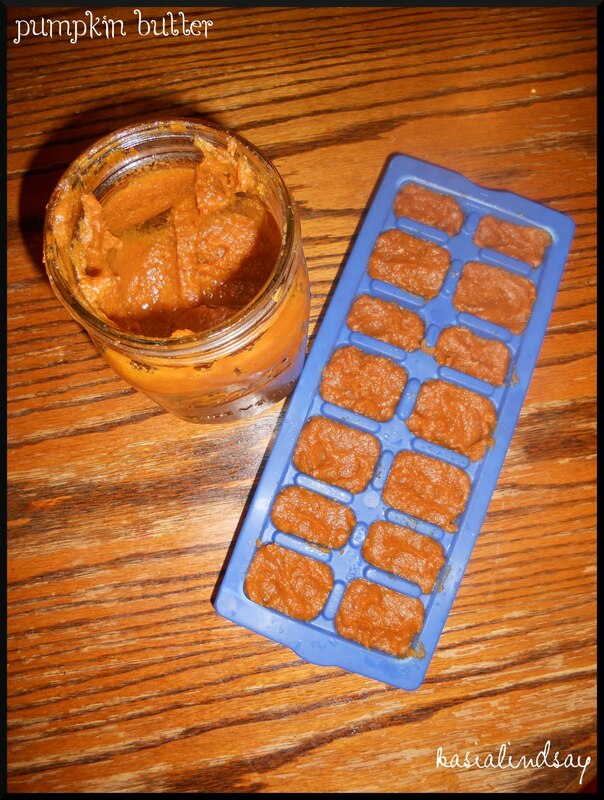 Put all the pieces in a strainer and place a bowl under it. Sprinkle the entire tablespoon of salt over the sticks. Sit the zucchini in the refrigerator for at least an hour and let the salt work it’s magic. DON’T skip this step! It’s essential for ending up with firm crisp sticks and not soggy wet ones. It really does drain a lot of water (see above picture with odd light green looking liquid). Once the hour passes, preheat over to 425. Discard zucchini liquid and rinse the sticks well with cold water. Lay them out on a clean kitchen towel and dry. Pat gently to remove any excess liquid. Dip sticks one by one in the egg and then roll in the crumbs. Use the one wet hand one dry hand method and really do them one at a time. If you dump them all in the crumbs mixture it will get gloppy and you’ll have to add more. Place on a parchment lined baked sheet close together. Bake for 12 minutes and then flip them. You can use a spatula to flip, but I find it easier to just quickly do it by hand. Bake an additional 15 minutes until browning and crisp. To reheat leftovers bake for 10-15 minutes on 375. Original recipe at tastykitchen.com. I followed the recipe exactly. I just subbed the cayenne for Tony’s like a true Mississippian/Louisianan would do. Preheat oven to 425 (I cooked the potatoes and zucchini at the same time and same temp). Wash and peel sweet potato. Cut into 1/2 inch sticks. Toss the sweet potato sticks, olive oil, and seasonings in a bowl until coated. Arrange fries evenly on a parchment lined cookie sheet. Bake for 15 minutes and turn them. Bake for 15 minutes longer or until firm and crisping. Happy April Fools Day! Fool some people with these healthy baked “fries.” They’ll never miss the oil and deep fryers. 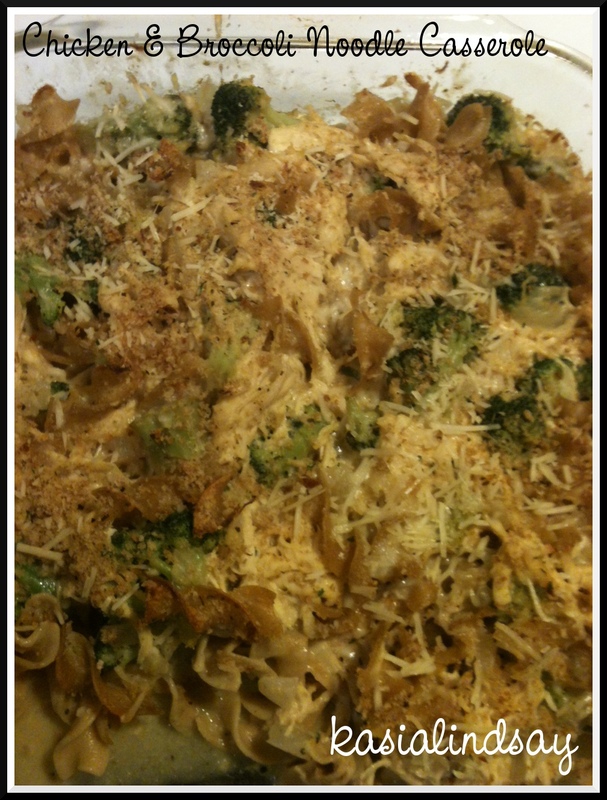 If you’ve been following, you know that one of this week’s meals was Skinnytaste’s Chicken and Broccoli Noodle Casserole. Oh my goodness was it good! I served it to four RAs and myself for one of their birthdays this week. They all LOVED it. They had seconds and thirds and raved about it the entire time. I even got a few more comments from the eaters the next day. You know you made a good meal when people still talk about it days later. 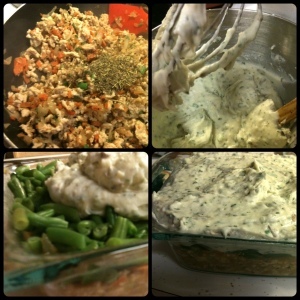 With some basic ingredients and a little effort you can have a yummy, filling, impressive casserole. It’s a creamy casserole with absolutely NO cream of anything canned soups. I only changed the recipe just slightly. I used skim milk instead of 1% and Great Value whole wheat extra wide noodles instead of the more expensive brand. The other changes were minor as well and just based on my personal preferences. 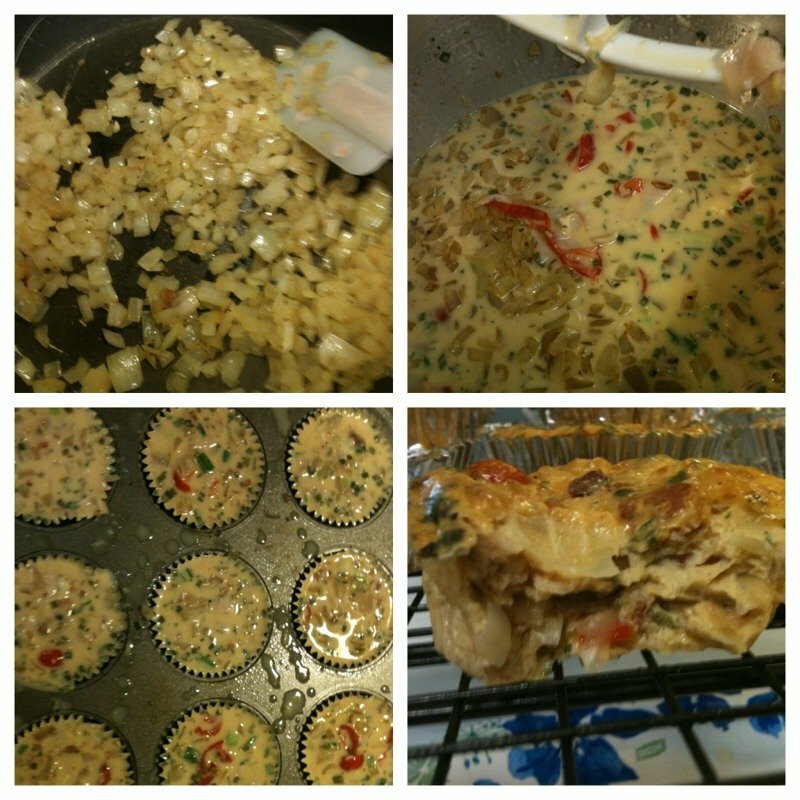 I’ll write the recipe with the changes I made, but please see the above listing for the original. 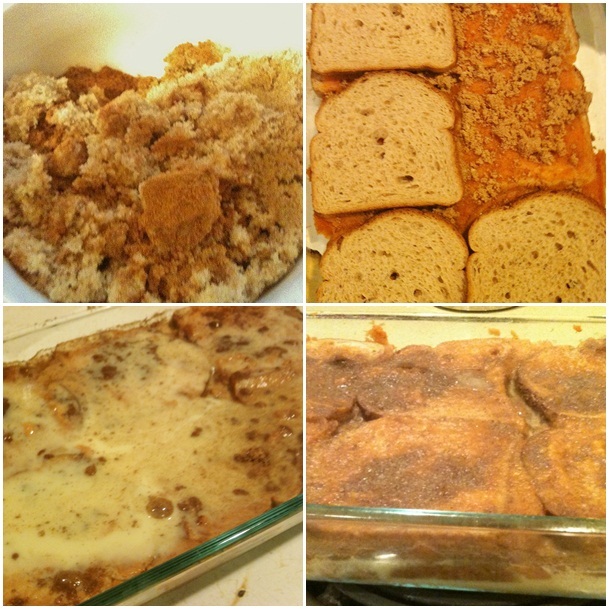 I make my own bread crumbs from lower calorie bread, freeze them, and always have them on hand for recipes. Doing a little prep work the night before or on your prep work day is a great way to make this meal take less time to prepare. Things you can do before: make bread crumbs, make chicken stock, make shredded chicken and pre-measure it out, and chop onions to keep on hand for recipes. I used the shredded chicken I made on meal prep day on this recipe. I also rely on my good scale OFTEN! Cook noodles in salted water until soft with a little bite. Drain and set aside. Noodles will cook in the oven too, so under cooking them just slightly is okay. Preheat oven to 375. Heat oil in a skillet. Add garlic and cook on medium heat until golden brown. Add frozen broccoli and saute with oil and garlic until broccoli gets soft and a few sprigs are just barely turning brown. Set aside. In another skillet heat butter until melted. Add minced onion and a little salt to sweat the onions, cook until translucent and soft. Add flour. Cook 2-3 more minutes coating onions in the flour. 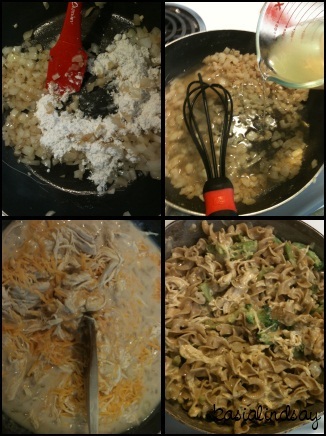 I like to multitask to minimize time, so I was cooking noodles, broccoli, and onions all at the same time. I recommend doing it that way, but if it stresses you out do it at your own pace and own way. Add chicken broth to the onions and flour. Whisk in slowly. Stir in milk and bring to a boil. Simmer, stirring occasionally until thickened. Remove from heat and stir in cheddar cheese and 1 tbsp of the parmesan cheese. Mix until cheese is almost completely melted. Add the shredded chicken, broccoli and noodles. Stir until everything is coated and pour into a sprayed 9 x 13 baking dish. Top with remaining parmesan cheese and bread crumbs. Spray cooking spray lightly on top and bake for 25-30 minutes. I always have to think really hard about sides for dishes like this. 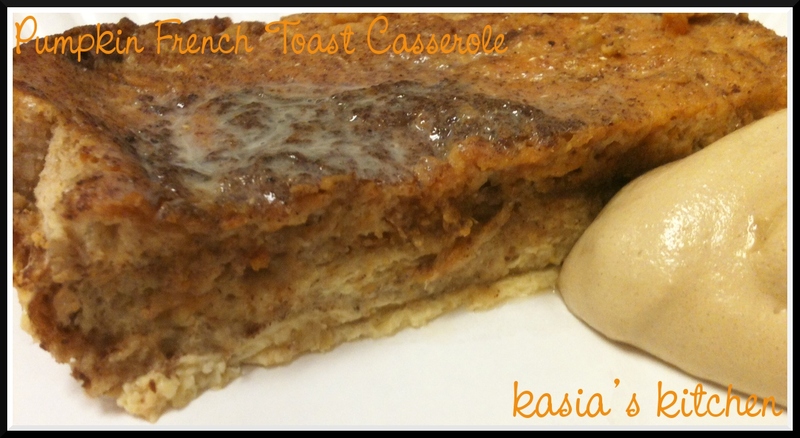 Casseroles often have everything in them! Starch, veggies, dairy. Steam in the bag veggies can be great side dishes if you doctor them up a bit. I served this with two additional veggies, one starchy and one green. I made steam in the bag corn with a tablespoon of yogurt butter, a little salt, a good bit of fresh cracked black pepper. I also made steam in the bag brussel sprouts. I quartered them after they cooked. That part is a little hot, but just do it fast! It’s worth it. People will like brussel sprouts if you chop them up a bit. I sauteed them in some yogurt butter and added Tony’s with a heavy hand (I love that stuff!). I didn’t calculate the points for my version, but it would be equal to or less than hers since I used skim milk. Her recipe is 8 points for 1/6th of the recipe.